- Enabled temporary (construction) dimensions for all foundation types. - Added a section in the General tab of the global settings for configuring construction dimensions. - Licensee name now appears in the License tab of the Global Settings when plugin is registered. - Fixed bug in the registration/licensing module. Now I just need to add the stats tabe into the attributes and then we can also bring this data into the Medeek Estimator module. I think it would also be useful to quantify the rebar and provide the size (dia.) and total lineal feet for each size used. For the wires mesh I'm assuming that number would be a sqft (area) but I'm not sure whether to provide the area which includes my (inside) offset or just the total area of the slab itself. All also have the FPSF option which includes foam around the perimeter of the foundation. I'm assuming this number would probably be the thickness and sqft (area)? Note that the area dimension is the total area of the slab per its outer perimeter, so a garage curb will not change this number. - Foundation and Footing labels option added to the General tab of the Global Settings. - Foundation and Footing label prefixes can be customized in the General tab of the Global Settings. - Foundation labels enabled for slab-on-grade foundations. - When construction callouts are enabled the overall area and volume (concrete) of the foundation is displayed beneath foundation label (currently only slab-on-grade foundation assemblies have this feature available). - Added customizable colors for lumber, PT Lumber and labels within the Materials tab of the Global Settings. The customizable colors for the lumber (PT) will not take affect until I update the stemwall module. Currently the color of the lumber is still hard coded into this module. I am also working on an update to the Medeek Estimator which will then allow the user to quantify foundations as well as roof and wall assemblies. So far I have the concrete, rebar, and anchor bolts queued up for analysis in the estimator module. I will need to still work on adding in the insulation (foam) for the FPSF option. 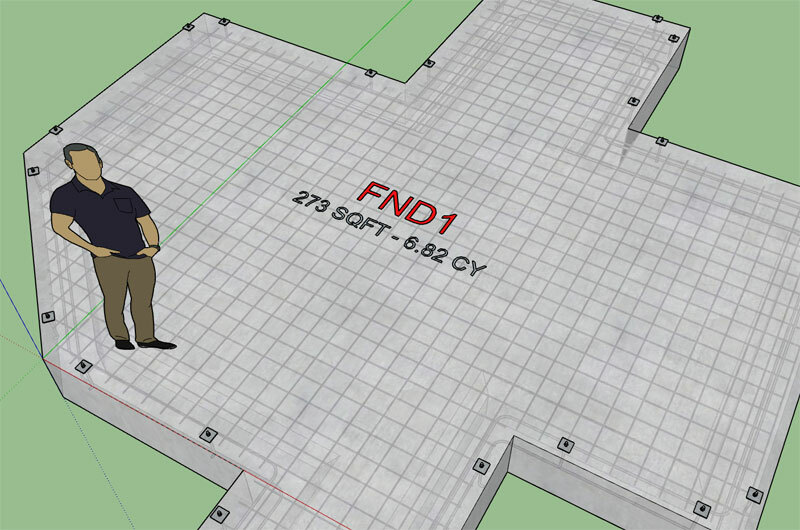 The first foundation type that will be made available in the estimator is the slab-on-grade. Once I am satisfied with the integration between the two plugins I will continue to flesh out the rest of the foundation types. The bigger issue right now is the lack of parametrics for this plugin. With the addition of the attribute library I am one step closer to making this happen. There is really nothing special that needs to happen it is just a matter of pulling together the HTML menus and other tedious tasks within the Ruby code. I apologize that it has taken this long to begin to address the parametrics issue. As can be seen in the changelog I had a burst of activity in 2017 and then only recently began to slowly process other updates. Most of my time has been spent on the other two plugins but it is my goal this year to bring this plugin up to par with the other two. Estimating data for slab-on-grade foundations is now available with Version 0.9.9w of the Wall plugin. - Updated toolbar icons to be compatible with 4k (UHD) resolution monitors.